The task that was to be performed in this project was to construct a Rube Goldberg Machine that could catch and throw a Ping-Pong ball. 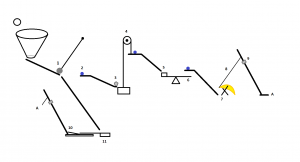 The final design is a Rube Goldberg machine which has eleven energy transfers and seven sources of potential energy. 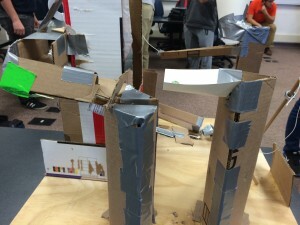 The device will be initiated by the dropping of a Ping Pong ball into a Styrofoam cup mounted to a cardboard tower. 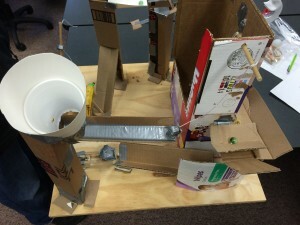 The ball then rolls down a ramp attached to the tower, hits a pendulum, and then rolls down the second ramp landing in the mouse trap launcher to be launched to the next group. 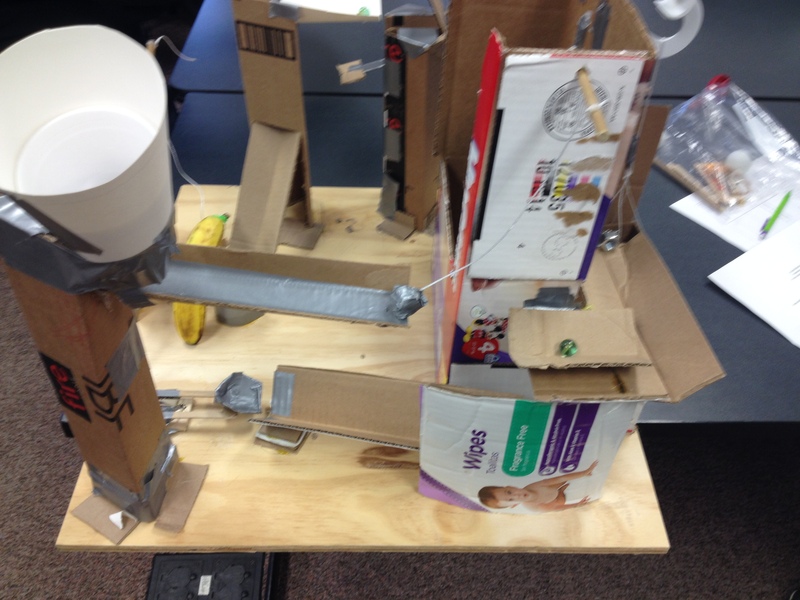 The pendulum that was hit by ping pong ball swings and hits a marble which then rolls down a cardboard ramp. The marble hits a nut at the end of the ramp, which causes the nut and marble to fall and then land in a box on one end of the pulley. This causes the weight to become uneven and the side with the weights in it start to fall towards the plywood base. 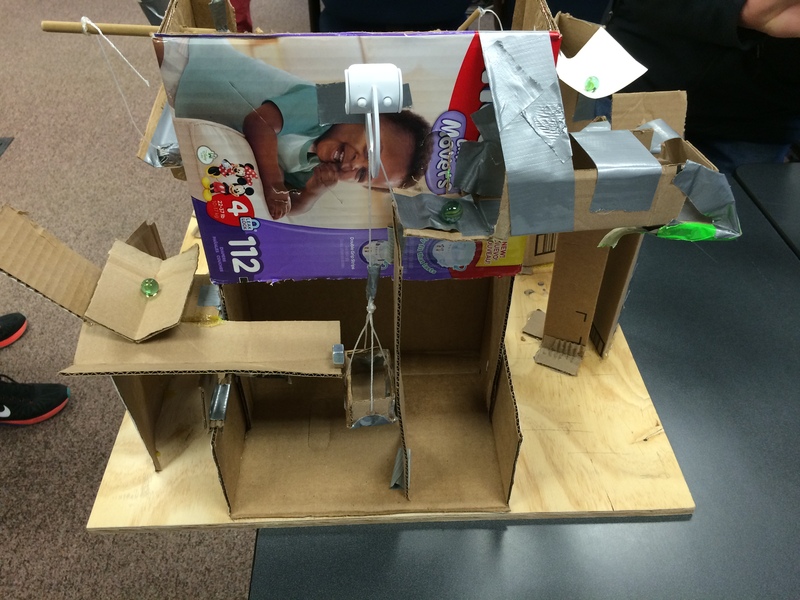 The other end of the pulley is tied to the edge of a cardboard ramp which has another marble on it. 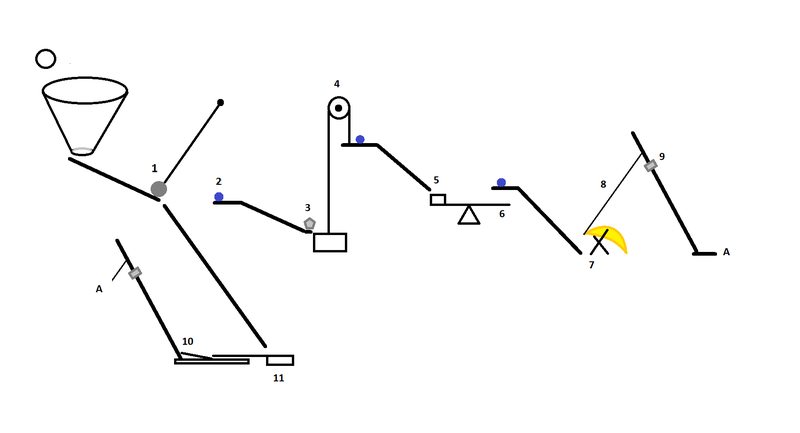 As the string pulls on this side, the incline of the ramp increases and the marble rolls down, landing on the elevated end of a lever. The other end of the lever raises and then hits the ramp which has third marble on it. The third marble starts to roll down a ramp and hits some Popsicle sticks that are propping up a banana tied to a string. 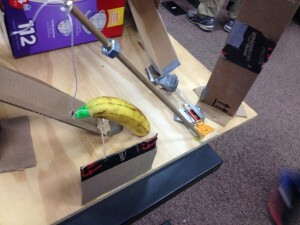 Upon hitting the sticks, the banana falls, thus agitating the string. A nut is balanced on the tip of a dowel that the banana is tied to. When the banana falls, the dowel will jerk, which will cause the nut to become unsettled and then slide down the dowel, hitting the trigger of the mousetrap. This will cause the Ping Pong ball to be flung to the next group’s machine.